When it comes to vaccine reactions, are they normal or just common in our modern world? What about childhood obesity? Allergies? Autoimmune disease? 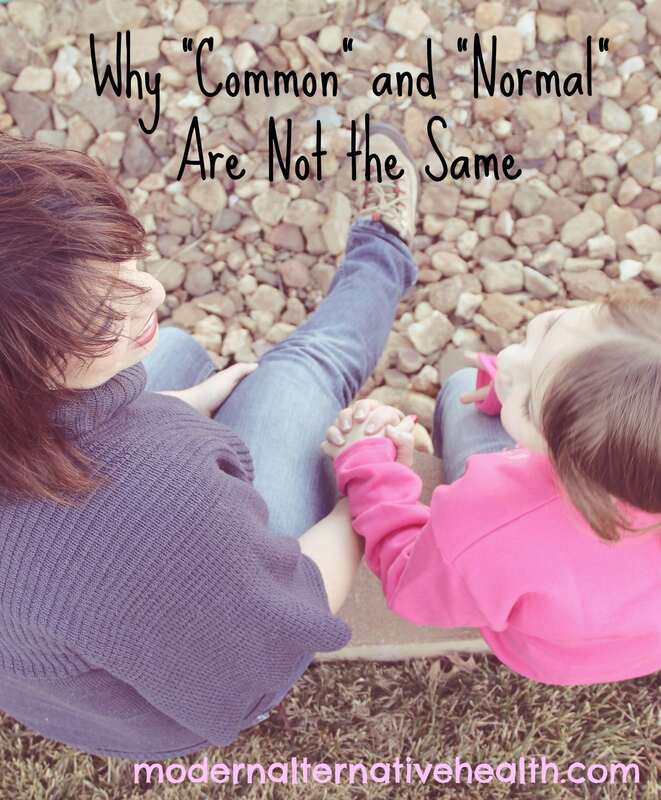 Normal and common are words often used interchangeably when discussing these issues, but do they really mean the same thing? Your answer could be five paragraphs long of how “this” – a vaccine reaction – is “common,” but no, it’s not “normal” in the way that you are (or should be) using the word. You comment or private message her to try to explain her options – detox, no more vaccines, and talk of exemptions. You try to go about your day, but her worry over a high fever and all body rash is hard to forget. Maybe you too were in her position one day years ago. Or maybe you just have a handful of now-friends who you’ve sent the same message to. This becomes “normal” to you, because everyone is vaccinating and using the modern medical system that is poisoning our children, and it takes a serious illness or death to make us see it. Your friends have seen your “anti-vax” posts and once they see the reality of the posts themselves, lying in their arms, they know to reach out to you. The one who will tell them, this is not normal. But, it sure is common. 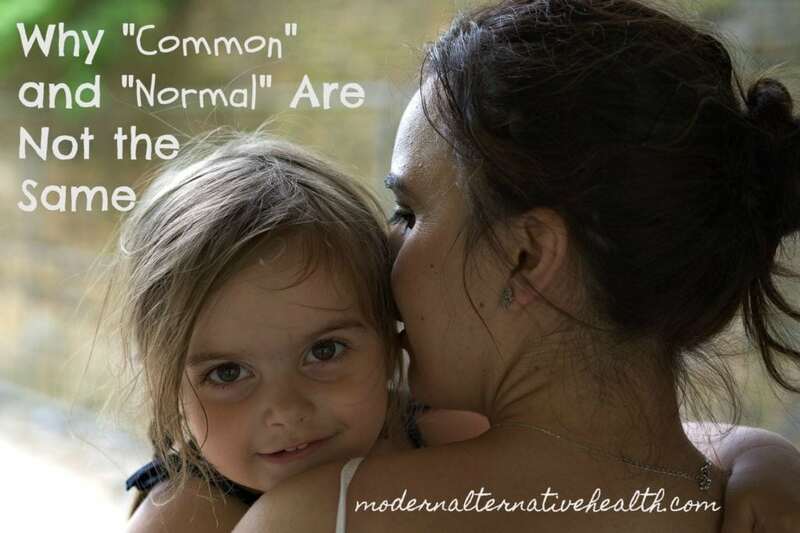 Your mom may have said that “normal” is just a setting on a washing machine. By the time you’ve wiped your first bottom, you may have realized she was right about a normal life. But, health is different. With health, there is a gold standard that is worth attaining – or at least trying to – with your best, each day. Autoimmune disease, asthma, obesity, heart disease, diabetes – these are NOT the new “gold standard” for childhood. This is very common today, but not in any way normal for the human body. The gold standard really is a healthy, active, and intelligent child who can think and learn for themselves, who loves to learn from their parents, friends, and siblings, and maybe sees a cold or illness for a few days no more than once a year. A child who is free from chronic illness without the help of injections, pills, and treatments. Constant eczema from GMO and processed foods. Genetically modified foods, covered with pesticides, is not normal. No other generation of humans lived this way. Processed foods sold from a grocery store at a high premium is not normal. Our ancestors would wonder what we are doing, working overtime to purchase foods that are killing us, not having time to see our children, when healthy foods could be grown and raised in our own backyards (if we still have them) for next to nothing. Our standard of life today regarding health and disease has fallen way below normal. Our health is now a good – bought and sold at a premium for a handful of greedy corporations, which our government mandates, legalizes, approves, and denies. Parents and grandparents no longer pass down health and healthy living advice. They are told that their historic knowledge is no longer “normal,” or right, and that we need to pay someone to get advice that has no historic basis. You are left to pay a high fee to a licensed physician you likely don’t know well. You have to take their word for it, with your most precious treasure (your child’s life), because you don’t know if they are right or wrong, or how to heal your child yourself. Friends, this isn’t normal. And look around – it isn’t working. I would be more than happy to sell my house to pay a physician for true health advice if I would get it. But as we see the number of illnesses and deaths increase in this country despite the “best” (mandated) healthcare, we need to be honest with ourselves that this is not normal – and it’s not good for us. The tough reality is that you will need to take your family’s health into your own hands, and that means educating yourself. You need to understand how all of the things that go into your body affect you. I know that seems like a lot, and it is. Simply think, “could my ancestors have eaten this 100 years ago?” If the answer is no – because it’s packaged, processed, and not resembling an animal or plant anymore – put it back. Move to traditional, whole foods that your great-grandmother would recognize as food. If you are hooked to city water, your water supply has loads of chemicals. Opt for a water purifier, and an air purifier while you’re at it. Limit your exposure to electronics and WiFi, which emits harmful EMFs. Play outside (barefoot) and encourage your children to play with simple toys and use their imagination. Make rest, sleep, and whole foods and living your priority over everything else. From the doctor, to prescriptions, to your every OTC medications – you need to reevaluate what is in your medical treatments. Most treatments are a bandaid on a bigger issue. One that can be healed by a changed lifestyle including whole foods. Mamas, this is not normal. But it is so common. Because 99% of the culture around you is living in the modern medical and food system, and illness has become normal. But illness is not a normal function of the body, and you can opt out of common and live in health, abundant normal health. My three boys (7, 5, and 3) are very healthy. We don’t have any of the issues listed. My oldest has asked lately if we can go to Burger King, and what is it? He’s heard from his friends at school. I told him that the burgers I make are much better, ha ha.